Movember, is the month-long event in November when brave and selfless men around the world grow a moustache, with the support of the women in their lives, to raise awareness and funds for men’s health - specifically prostate and testicular cancer and men's mental health. 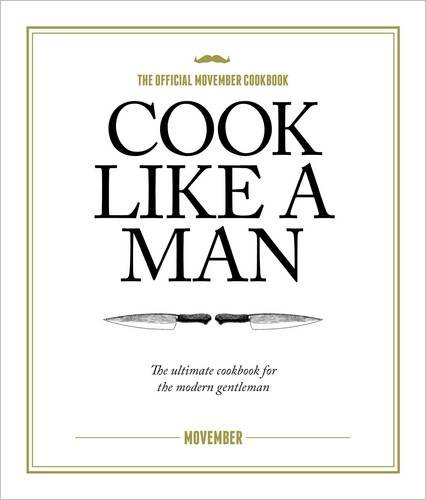 Cook Like A Man is the official Movember cookbook, offering recipes for the modern gentleman. There was once a time when Mo Bros could be found wandering, lost and bewildered, in kitchens around the world. Helpless and unable to fend for themselves, they sought comfort and sustenance from pre-packaged meals, takeaway curries and the easy pickings of kebab shops. But no longer is this so. For now is the hour of the Mo Bro Chef. A gastronomic trailblazer, he has taken back the territory over which he once reigned with fearless elan. Today, if you look closely, you can find him at dawn on a Saturday roving the fish markets, perusing the morning’s catch with a discerning eye. He’s that man at the butcher, checking the marble of the aged rib-eye. That man by the side of the highway picking blackberries by the bucket load. That man at the barbecue, centre of attention and master of his domain. That man with a moustache. Cook Like A Man offers delicious, hearty, man-friendly recipes contributed by Mo Bro chefs around the UK, Ireland, Spain and Finland, including David Johnson, Head Chef at The Albion, and Sam Wilson, head Chef at Caravan Kings Cross London – accompanied, of course, by advice on how to conduct yourself like a modern gentleman, both in and out of the kitchen. This Movember cookbook will help you cook like a man.